Eric William Benjafield was one of them. By the time Eric Benjafield enlisted in the AIF in early 1916, the sense of adventure which characterised those who joined in the early stages of the war had been replaced with a more sober realisation of what lay ahead. The heavy casualties from the Gallipoli campaign had brought a new realism to the decision to “join up”. Yet, when this fresh faced young man lined up for his new uniform, the full horrors of the Western Front had not yet been encountered by Australian troops. Eric William Benjafield was born on the 7th of October 1893 at Latrobe in North West Tasmania. Life in that beautiful part of the world would have been great for a young lad. Plenty of fresh air, good food - locally produced - and exercise aplenty all served to produce strong and healthy young men, at just the time the Empire called. Eric's father, Frederick Benjafield, was Postmaster at Devonport West Post Office and wished to ensure his son had every opportunity to progress through life. 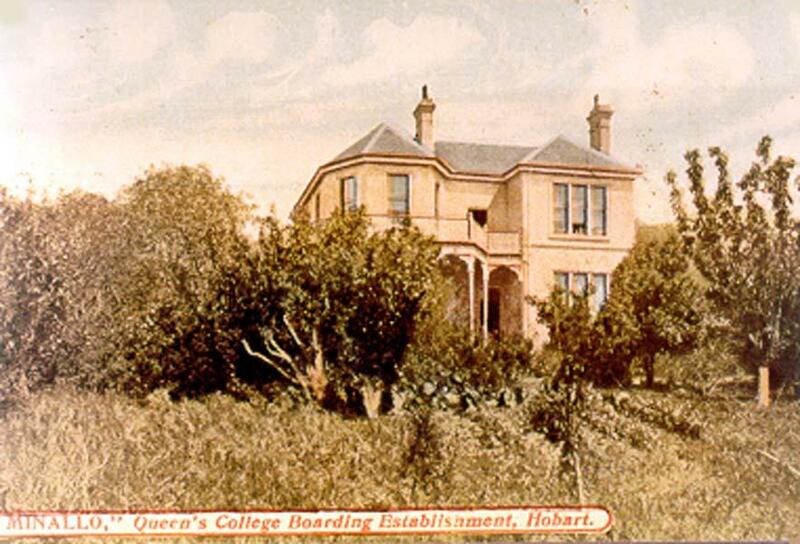 It was for this reason that young Eric found himself a boarder at Queens College in Hobart, where he completed his education. While he commenced his career as a “civil servant” in the young Commonwealth Public Service, available records do not indicate, definitively, in which Commonwealth Department Eric served. 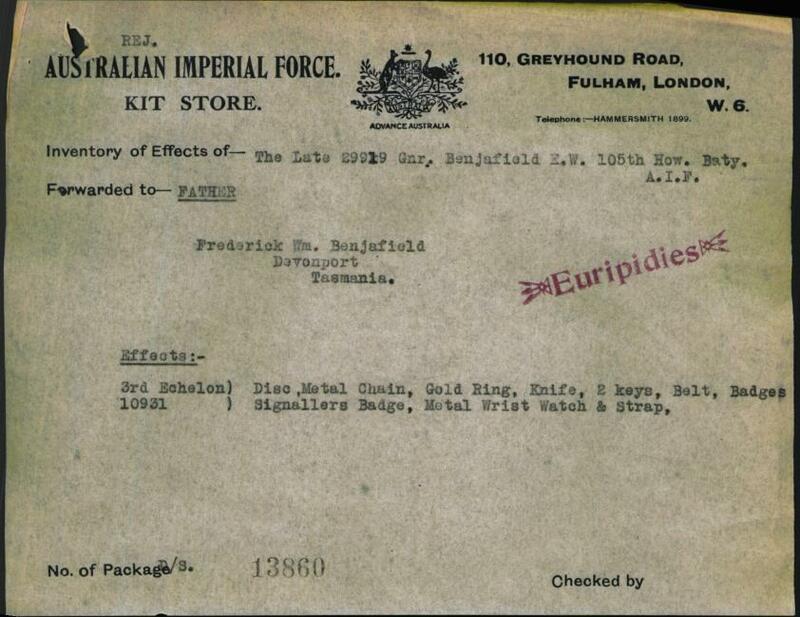 However, the Australian Customs Department in Canberra clearly identifies a “Benjafield, EW” as one of their officers who served in the 1st World War. Furthermore, Australian War Memorial and National Archives of Australia records indicate only two Eric Benjafield's as serving in that war, one of whom is an Eric William Benjafield. Given that the other Eric is described as an orchardist or farmer from south of Hobart, it is reasonable to consider that “our” Eric was an employee of the Customs Department. Eric appears to have relocated to Melbourne at some stage prior to his enlistment. The evidence for this is suggested from two sources. The first pointer to Eric's residency at this time is his pre-enlistment medical examination which was conducted, in Melbourne, on the 28th of January 1916. The second pointer is less precise. Voting age in those days was at 21 years, which meant Eric was too young for the election of September 1914 and, as could be expected, there is no electoral roll record of him up to that time. However, the next election was called for the 5th of May 1917 (writs issued on the 26th of March 1917) and the Conscription Referendum was held in 1916. Troops, both at home and abroad would have been given the opportunity to register and vote and, in any case, Eric attained his “majority” in October 1914. 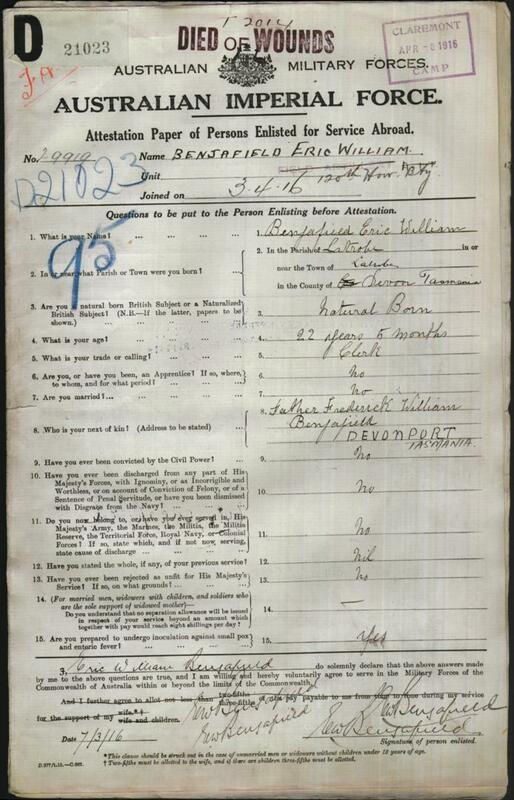 The only Electoral Roll entry is of an Eric William Bengafield (note spelling) in the 1919 roll showing an address at 195 Brighton Rd Elwood Vic. As this is the only “Bengafield” of any gender or given name in Australia on an electoral roll between 1901 and 1936, it is reasonable to assume this to be “our” Eric and representing his civilian residency in 1914-1916. 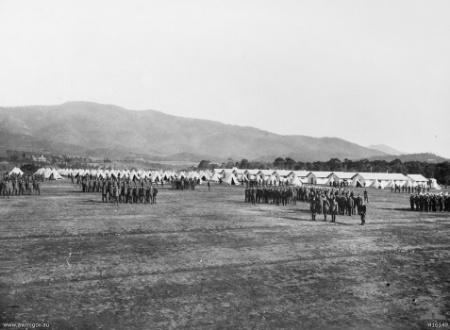 Notwithstanding his whereabouts when he chose to enlist, Eric must have returned to Tasmania shortly thereafter, for family or military reasons we can guess, as his attestation papers were signed at the Claremont Camp outside Hobart on the 3rd of April 1916. Perhaps it is as well that he did choose to visit his family at this time. Nevertheless, he was soon back in Melbourne as part of the 120th Howitzer Battery. On the 3rd of April, Eric transferred to the 105th Battery, operating near Bapaume, and on the 13th was severely wounded while his unit was engaged in an artillery duel. Sadly, he succumbed to his injuries and died the next day. “At Noreuil, near Bullecourt, April 14/17 (April 14, 1917, ed), we were in action and Gnr Benjafield was wounded by a shell fragment, which caused septic poisoning. He walked to the dressing station and was sent to the C.C.S. (3rd) (No.3 Australian Casualty Clearing Station, ed) where he died at 12 (noon) next day. He was buried in Achill le grand Cemetery, about 2 miles from Bapaume, and I saw the grave about a month later, when I went to the same C.C.S. Wounded. His great chum, Gnr Paton, sent his things home.” 11628 Gnr I. Robey, 105 Howitzer Bty, 28.8.17. 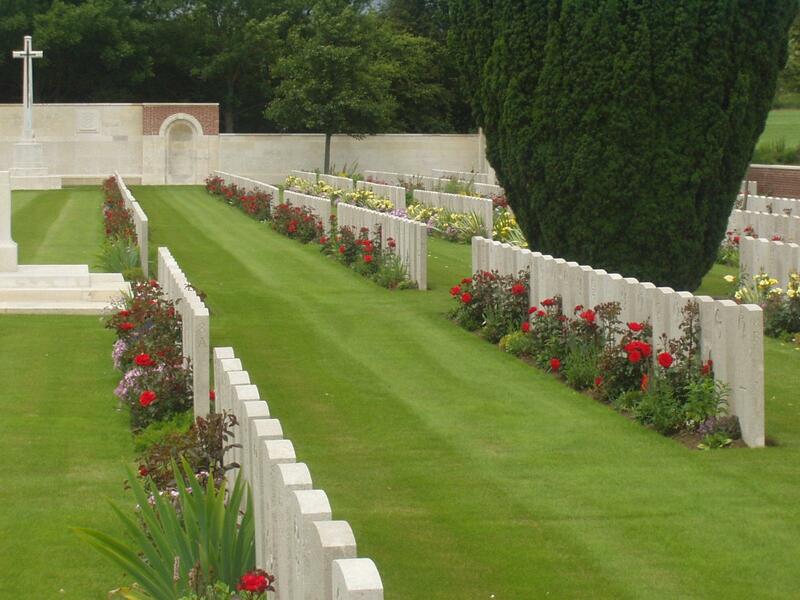 Eric William Benjafield was finally laid to rest at Greviller British Cemetery, Bapaume, France. However, for those that were left this was and would never be the end of the story. Eric's family, as with tens of thousands of other families across the nation, would live with the memory of a son, husband, father who would not return. What's more, they would continue to receive “official” reminders of their loss from a government that, perhaps, was equally struggling with its own grief, or guilt. 9 April 1923 – Victory Medal.